In anticipation of some great events and occasions that are taking place this summer, we have been creating some new promotional artwork for long standing igoo clients, Alma De Cuba. Based on the former site of St. Peter’s Catholic Church on Seel Street, Liverpool city centre, the striking venue is the perfect place to celebrate special days and to let yourself be swept up in the spirit of Latin America. 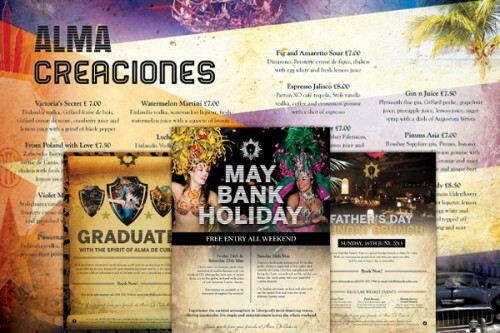 The new promotional material for the late May bank holiday weekend, graduation season and Father’s Day captures the carnival atmosphere that embodies Alma De Cuba, ensuring the venue stands out as the best place to head when it comes to throwing a party. igoo have created the copy for the recent Alma De Cuba artwork and are currently refreshing their cocktail menu, highlighting the impressive selection of drinks they have on offer.